It’s a low-cost (your startup costs could be basically zero), low-risk way to start an internet business. You don’t need any special equipment, tech knowledge or internet marketing experience and you don’t even need to be a professional writer. In fact, sometimes you don’t need to write much at all to have a blog. As with any online business, figuring out which market you want to be in is a vital part of being successful. Basically, you want to be in a niche where there are actual customers that are interested in the topic or topics you are writing about, otherwise nobody will read your blog. In the best-case scenario, your niche will also match up with something you have an interest in, which makes running the blog that much easier and more fun too. It won’t seem like work. Niche research involves keeping an eye on the news and trends through news websites and social networks such as Facebook. What are the products or activities that are on everybody’s mind now? Yoga is big. So is weight loss. Stock trading services. Alternative health remedies. There are a ton of hot niches out there. You can also scan Amazon and eBay bestseller lists to see what types of products people are voting for with their wallets. You can also use Google for research. First, use its keyword planner tool to find out web traffic for keywords related to your niche. If there is not much traffic for a certain topic (less than 1,000 searches per month), it’s probably not a good niche to be in. You can also just do regular old Google search for keywords related to your niche. If there are a lot of websites and blogs in the results — that’s a good thing! That means there is a ready market of people interested in that niche. Once you’ve made a list of some possible niches, pick one that you gel with and start blogging. Because you virtually don’t have any startup costs, there’s not much financial risk. You can always try a new niche if it doesn’t work out. The tech side of blogging. You don’t need any technical know-how to set up your blog. With free software such as WordPress and Blogger, you can get your blog online in minutes. And you can customize your blog with different themes and styles easily as well. These providers also give you free hosting. So setting up and putting your blog online is free. It’s all intuitive software. If you can surf the web and send an email — you can manage a blog using these programs. In the classic sense, a blog features written content. Often these are short articles. But these days, the sky is the limit when it comes to the types of content you can include. First, let me give you some idea starters for written blog posts. The most important thing to remember here is to write conversationally. You want to build a rapport with your audience — you want them to think of you as a trusted resource. To that end, your blog posts should be useful, informative and easy to read. You could include how-to articles, top 10 lists, reviews, commentary on news and trends. Of course, all the written content should be relevant to your niche. For example, if you have a European travel blog, you could do a review of hotels in Berlin or include tips for getting into museums in Madrid for half-price. Include photos in your blog posts. Some posts could be all photos, really. You can also include videos — hosted on YouTube and then embedded on your site is the easiest (and free) way to do that. Again, these videos should be useful and entertaining. If your blog is about dog training, you could demonstrate some dog training techniques. You can even use your smartphone to record the videos — no professional set up needed. But no matter what form your blog content comes in, you do have to follow some guidelines. Most importantly, you have to be consistent. You don’t have to include something every day. But you should be adding something several times a week. Come up with a schedule for posting new content and follow it. You can’t skip posting for a week, otherwise, you’ll lose your audience. They crave new content and will go elsewhere, like a competitor’s site. As a blogger, you have an edge right from the get go in getting people to visit your site. You see, Google these days places a lot of emphasis on useful and updated content. So just by having a blog that you update regularly means you will be placed high in the Google search rankings. So when a web surfer is looking for information or products related to your niche, your blog will be one of the first ones they see. This is called organic traffic because people are coming to your site naturally. That sort of qualified traffic is key because they are primed to buy or at least start reading your blog on a regular basis. You can also promote your blog on social sites such as Facebook and Twitter. When you put up a new blog post, be sure to post a link on your Facebook page. So you’ve been writing and adding other content to your blog on a regular basis. You’ve built up an audience. How does that add up to having a profitable online business? You have to advertise and sell products, of course. That’s why being in a market with prospects ready to buy related products is so important. As a new online entrepreneur, you have a couple of ways to go about this. And they don’t involve creating your own products, which is definitely something you should wait to do until you have a successful money-making venture up and running. Instead, you’ll want to get involved in selling other people’s products. That way you don’t have to invest in stock or take care of delivery and customer service. First, you should definitely include banner ads on your site. You’ve seen these before — many websites and blogs have them. Basically, they are attention-grabbing little ads with text and photos or illustrations. The headline and photo are usually something eye-catching, like a before and after of somebody who’s gone through a weight loss program. Every time somebody clicks on the ad, you get paid. It’s a very small amount, but it does add up over time. These days, to get these ads on your site, it’s all about becoming part of an ad network. These companies allow you to include ads on your site that will resonate with your audience. You go by category, but you can’t pick the specific ads that run on your blog. For example, on the Blog Ads network, you can pick categories that pertain to certain cities, as well as subjects such as parenting and fashion. Google’s AdSense is also a must-have. Here, Google’s algorithm serves up ads appropriate to your audience based on the content it scans on your site. To include the ads on your site, you just use a bit of code they provide and put it on your site and the ads are “served” automatically. The code also tracks how many clicks on the ads that are on your site. That way, you are fairly compensated. It’s easy. You set it up once and you’re basically done. The money comes in automatically. Of course, it won’t be all that much, especially at the beginning. But you can soon build up your revenue from banner ads to several hundred to a couple of thousand dollars per month. It all depends on how much traffic you get to your blog. The biggest moneymaker will be with affiliate marketing. Basically, you are promoting other people’s products. But this time, if a visitor to your blog buys the product, you get a percentage of the sale — a commission, in other words. You only promote the products on your blog. When it comes to order, they are sent to your affiliate partner’s website/order form. They handle the transaction and fulfillment of the order. You could do this through ads, too. But more effective is to be proactive in promoting affiliate products. For example, you could write a blog post all about a specific product. You could do reviews of several different products in the same niche. You could do a video demonstrating how to use a specific product. Whatever you do, you simply include a call to action at the end of the content that encourages the reader to buy the product. You include a link to do so. This will be an affiliate link that tracks each customer you send to your affiliate partners. Amazon has a major affiliate program. And with that etailer featuring what seems like every product known to man, you’re sure to find products that match your audience. CJ Affiliate is another major affiliate partner you should look closely at. 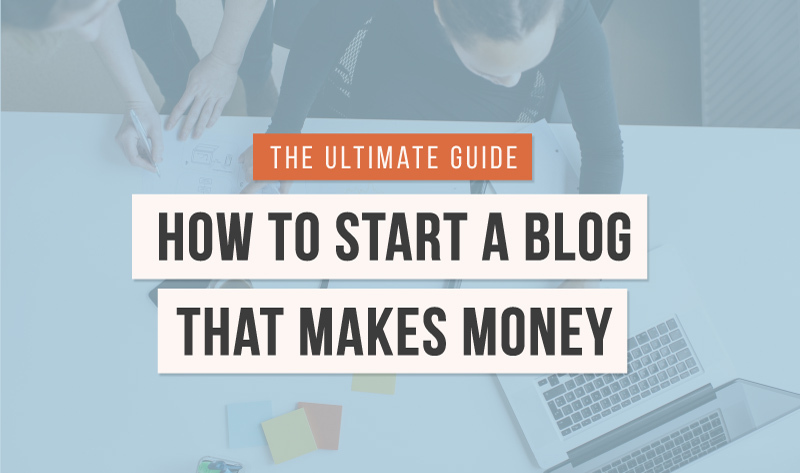 Starting a blog is a great way to dip your toe into the waters of online business. There’s no risk, you provide the content, and systems are in place to monetize your blog easily. And there’s never been a better time to be a money-making blogger. There are hundreds, if not thousands, of profitable niches to be involved in. But it’s important that you get started now. You won’t be profitable overnight. You have to build up an audience, keep them loyal by providing valuable free content and then turn them into paying customers. That process does take time. So don’t delay, get out there and start blogging.